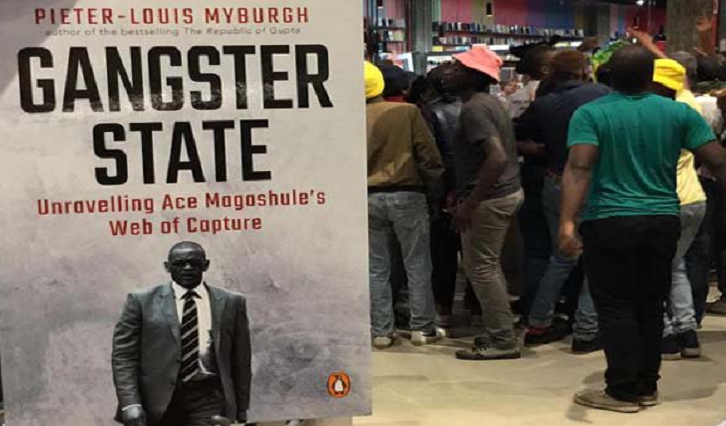 Civil society group defends launch of book 'Gangster State' in C Town - SABC News - Breaking news, special reports, world, business, sport coverage of all South African current events. Africa's news leader. The book profiles alleged shoddy dealings of ANC Secretary-General Ace Magashule during his time as Free State Premier. A group of people belonging to Unite Behind, a civil society coalition, have protested outside the Iziko Museum Slave Lodge near the Parliamentary Precinct during what they call a people’s launch in Cape Town of the book ‘Gangster State’ penned by investigative journalist Pieter-Louis Myburgh. Last week, a group of people stormed an Exclusive Books book store in Johannesburg where they vandalised the place and disrupted an event to launch the book by Myburgh. Unite Behind Spokesperson, Zackie Achmat, says their action is in defence of Freedom of Expression. This entry was posted on 15 Apr 2019,08:49PM at 8:49 PM and is filed under Lifestyle, Homepage Featured Story Slider. You can follow any responses to this entry through the RSS 2.0 feed. Both comments and pings are currently closed.